President Donald Trump’s acknowledgment that his infrastructure proposal would likely be legislated after the midterm elections, coupled with the recent departure of the administration’s top infrastructure adviser, has slowed momentum on efforts to boost funding for transportation systems. Advocates said they expected policymakers to make progress this year on a long-term funding measure that would help repair thousands of deficient bridges, dilapidated roads and neglected canals and transit systems. 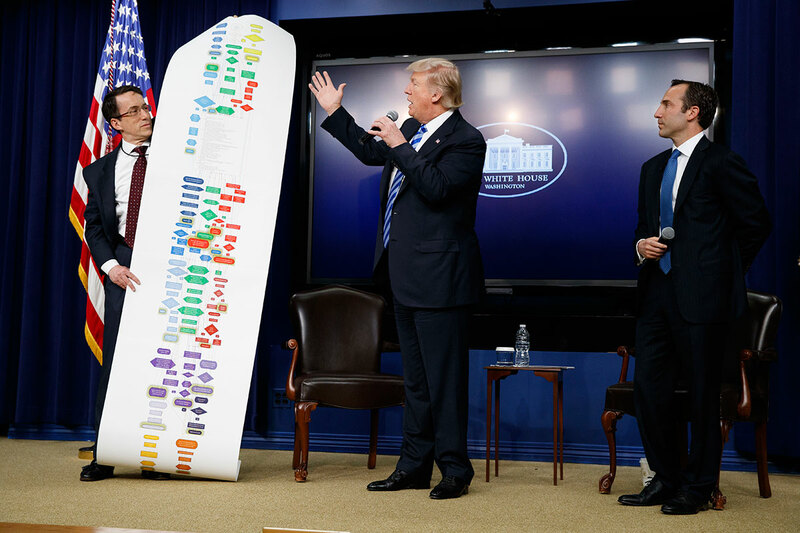 After all, the president indicated infrastructure topped his legislative priorities for 2018. However, freight executives and other infrastructure proponents told Transport Topics they will continue to remind the executive and legislative branches that infrastructure is in desperate need of upgrades. The White House on April 3 announced Trump’s infrastructure adviser David “DJ” Gribbin is pursuing opportunities outside the administration. A week earlier, the president told union workers in Ohio his $1.5 trillion infrastructure proposal, prepared under Gribbin’s direction, would very likely not get a vote in Congress until people vote in the elections in November. None of us got into this trying to make this happen and thought it was going to be easy. Trump’s infrastructure proposal consists of using $200 billion in federal funds to reach $1.5 trillion in nonfederal investments. Bill Sullivan, senior vice president of advocacy at American Trucking Associations, emphasized that advancing an intricate and massive infrastructure bill would face headwinds during a slow legislative year, especially with the midterm elections fast-approaching. Nevertheless, Sullivan explained, ATA remains committed to continue to educate policymakers about ways of improving freight connectivity. “We maintain hope that Congress will begin the work on infrastructure, and ATA will not be taking our foot off the gas to advocate for needed investment, funded with a common-sense, user fee-based solution,” Sullivan said. ATA proposed last year that Congress establish the Build America Fund. The federation estimates the fund could generate about $340 billion over a decade through a 20-cents-per-gallon built-in fee on transportation fuels. A tweet from the U.S. Chamber of Commerce said Gribbin’s departure is an opportunity to “build upon his efforts and move forward to gain congressional action to modernize America’s infrastructure.” The chamber is an organizer of “Infrastructure Week,” a series of workshops and seminars beginning May 14. Also undeterred by the latest legislative setback are the nearly three dozen national associations and labor unions that form the Transportation Construction Coalition. The group includes the American Road and Transportation Builders Association to advocate for a long-term fix to the Highway Trust Fund, which assists states with infrastructure maintenance and building projects. Its funding authority expires in less than three years. The coalition scheduled its “fly-in” legislative session in Washington during Infrastructure Week, on May 15, followed by visits with lawmakers on Capitol Hill the next day. “This year could be one of the most consequential in decades for transportation design and construction professionals as the Trump administration and Congress are poised to act on a major infrastructure package and permanent revenue solution for the ailing Highway Trust Fund,” said Matt Cummings, chairman of ARTBA and executive vice president at engineering firm Aecom, which provides design, consulting, construction, and management services. A White House official said wrapping up the president’s infrastructure proposal that was unveiled Feb. 12 was Gribbin’s reason for leaving. He promoted calls to streamline the permitting process for construction projects, which is another pillar of Trump’s proposal. Gribbin joined the White House’s National Economic Council more than a year ago. The president’s infrastructure vision relies heavily on the private sector. “His expertise has added tremendous value to the administration. We thank him for his hard work and dedication, and wish him well on his future endeavors. The NEC will continue to push the president’s infrastructure initiative as part of his pro-growth economic agenda,” said National Economic Council director Larry Kudlow, in a statement provided by a White House official. Prior to his role as special assistant to the president for infrastructure, Gribbin was a managing director at Macquarie Capital and had been general counsel at the U.S. Department of Transportation during President George W. Bush’s administration. He did not return requests seeking comment.